There is a lot of manipulation and fact distorting when it comes to the debate between highway and road benefits versus fixed rail transit. One of the biggest claims to have been made against Link is that it’s a “boondoggle,” a “waste of money,” and that “no one” ever rides the trains. I pulled up an old document from the American Dream Coalition (ADC), a big anti-rail group, which compiled a laundry list of “facts” against what it calls “myths” of rail transit. It’s a long list of points, many of which we’ve already debunked, but I thought I’d highlight a few that are relevant to the comparison often being made between roads and rail. The Reality: Outside of New York and a few other cities, rail transit carries too few people to noticeably reduce congestion. New York is the only urban area where transit has more than a 10 percent share of urban travel, and transit has more than a 3 percent share in only five other areas. Even if rail transit could increase transit’s share of travel, an increase from, say, 1.5 to 2.0 percent is simply not significant. In most urban areas, miles of daily driving are growing so fast that all the congestion relief provided by a billion-dollar rail project will be consumed by growth in a few weeks to a few months. I actually don’t need to say too much about this, because we’ve already covered how this is a giant distortion of the “transit share” numbers. But to recap, citing the overall transit share of all trips in a metro area is completely irrelevant when it comes to congestion. Contrary to the American Dream Coalition’s claim that an 0.5 percent increase in transit share is “not significant,” such an increase could be quite significant if it means that those trips are shifting to transit during peak commuting hours. And since work trips are only a certain percentage share of all trips, that increase is proportionally larger when looking at only work trips made, the ones that are actually inducing congestion. Investment in roads is always problematic because most spending is directed toward increasing capacity for peak commuters in lieu of buffering new investment in other areas, so the fair comparison can only be made in terms of work/peak trips. Frankly, we don’t mind a great deal if someone decides to hop in the car to return a Blockbuster movie at 2am in the morning. The Rush-Hour Myth: Rail transit can cost-effectively reduce rush hour congestion. The Reality: While a few rail-transit lines may have had a marginal effect on rush-hour congestion, the cost is exorbitant. The average light-rail line under construction or in planning stages today costs $25 million per mile ($50 million per mile in both directions). Heavy rail costs more than twice as much. By comparison, the average lane mile of freeway costs only about $5 to $10 million. Since freeway lanes carry far more people than any rail line outside of New York, they are much more cost effective. Running express buses on high-occupancy vehicle or high-occupancy/toll lanes will carry more people at a far lower cost than rail. Rail opponents love using this argument because the assumption is that fixed transit is just not cost-effective. But when you take a good look at the numbers, it’s easy to find that the comparison being made with highways just isn’t an equitable one. The third sentence in the “reality” rebuttal makes mention of an “average lane mile,” but doesn’t really expound. Well, a highway lane mile is exactly as it sounds: one mile of one lane in one direction. But the ADC makes it sound like the cost-per-lane mile is the actual cost-per-mile of a freeway, which it is not. The number doesn’t figure in the total number of lanes that are being paved down in each direction for a complete freeway segment. When it comes to capital costs in the Puget Sound area, our highway infrastructure tends to be a bit more expensive for the same reasons why Link has a higher cost-per-mile (close to $200 million for both directions). Granted, costs vary a lot from project to project, but just to cite an example from our area, the 2004 estimates for I-405 expansion put the cost-per-lane mile between $61-69 million. That figure is just for every mile of single lane put down, but when considering that I-405 is a bi-directional, multi-lane freeway, the aggregate capital costs sunk into construction and mitigation exceed even Link’s relatively high price tag. Since highway construction can be either incredibly cheap or incredibly expensive, it’s better to look at the comparable capacities between one lane of highway and a single track of rail. Freeways cannot exceed a flow of 2,000 automobiles per hour per lane without inducing congestion. Light rail, on the other hand, can serve up to 12,000 passengers per hour on single tracks, depending on headway frequencies and the number of rail cars being coupled together. Marginally, the dollars are put to much better use in fixed transit investment, particularly when considering the next point. The Operating-Cost Myth: Rails cost less to operate than buses. The Reality: Almost all rail transit systems cost more to operate than buses running on routes in comparable corridors. Rail transit sometimes costs less to operate than the average bus route in a bus system. But rail lines are usually built along the most popular travel corridors, where costs per rider are lowest. The bus lines that rail replaces almost always cost less to operate than the rail lines that replace them. Even the average bus lines cost less to operate per ride than heavy-rail systems in Baltimore, Chicago, and Miami, and less than light-rail systems in Dallas, Los Angeles, Pittsburgh, and San Francisco. The ADC doesn’t clarify its argument very well here, but from what I can gather, they’re arguing that certain bus lines have a lower cost-per-boarding (CPB) than comparable rail lines. The argument is cleverly manipulative. Take a look at the syntax in the first sentence: “Almost all rail transit systems cost more to operate than buses running on routes in comparable corridors.” The ADC avoids using “average” or “overall” with good reason. They could very well be arguing that a packed commuter bus is cheaper to operate than a lightly-used train at 1am, which it is. But when it comes down to the average costs-per-boarding between all rail and bus service in any given system and not just between “comparable corridors,” the latter is almost always more expensive. As we know, the CPB depends on ridership, and for a new and growing system like Central Link, it’s terribly unfair to compare its operating costs against those of ST Express and Metro. What’s interesting, though, is the fact that Tacoma Link has a lower CPB than the average ST Express bus; that’s a pretty good indication of what will happen once Central Link is broken in. “American Dream Coalition” – Where do they come up with these names? That’s hilarious. Conservatives love to use those kind of words. A step from just proclaiming it “The War on Transit”. You all might enjoy this article by Paul Weyrich called “12 Anti-Transit Myths: A Conservative Critique”. Weyrich was a famous conservative / libertarian thinker and he takes on ADC, the Reason Foundation and other road warriors in libertarian clothing. He makes the case based entirely on conservative and libertarian principles (i.e. none of that bleeding heart hippy crap like “protecting the environment” or “helping poor people”). He tears apart the fallacious arguments of the “anti-transit troubadours” with biting sarcasm and condescension and shows clearly that rail opponents have no right to claim the banners of freedom, mobility, free-market capitalism, or fiscal responsibility. Weyrich has written a number of other articles on the subject as well, most of which can be found on the APTA website. I did not agree with Weyrich on his non-transportation politics, but pro-transit people lost a good friend when he passed on last year. As for the ADC, I wonder, is Kemper Freeman a member. He seems to have bought into the talking points on Portland a failure. I know Randall O’Toole is one of their biggest mouthpieces, and debunks Portland all the time(I don’t buy his arguments, just saying he says he is debunking Portland’s success), when the majority of TriMet’s daily riders come from 3(now 4)MAX lines. Last year, Passenger Train Journal ran a little archive of the past 40 year(minus the 10 years they were out of print) of issues, and mentioned a little(1 line) about once running an article on rail passenger service in the WIllamette Valley in the late 1970s early 1980s written by O’Toole. Either they were running articles for the oppisition to provide a little balance then, or O’Toole might have been for 5 minutes a supporter of rail. Meanwhile in Los Angeles, they are working on planning for a couple extensions of both legs of the Gold Line that could by the time it is finished, be the longest Light Rail line in the country, at over 50 miles. Hopefully in the meantime, they will get the Regional Connector so passengers don’t have to transfer from the Blue to the Red Line to get to the Gold Line. They’re not helping by suggesting that train riders are more likely to be there by choice. This plays into the hands of anti-rail groups like the Bus Riders Unions of Seattle and Los Angeles, who never met a train they liked and think that all mobility problems can be fixed by just rolling out more buses. Their central tenet is that trains embody a racist plot to take money from the poor people of color on the buses and spend it on the rich white folks who ride Metrorail. The only trouble with this is it’s patently untrue. The passengers on L.A.’s rail lines are overwhelmingly nonwhite. If the subway through West Hollywood and the West Side does get finished, then we probably will see some more white passengers, since it will then be possible for suburbanites living near the Metrolink lines to travel by subway to offices on the Westside, after arriving downtown on Metrolink. But as far as I’m concerned it doesn’t matter who uses transit. The more the better. But there was also a bubble in Nevada and the District of Columbia, where there is absolutely no Growth Management. But the Toole does not address this. Perhaps Oregon, Florida, California (and Hawaii which he also mentions) have something else that drives up their value which?? Hmmm…what could that be?? For Hawaii, I wonder if it is that geographic problem. Just about everything they need, even building lumber, I believe, gets transported via ships that leave from Seattle, Tacoma, Oakland, and Los Angeles(Matson and Horizon Lines), and even the trash gets shipped back here, even though some in Hawaii would rather burn it to make electricity. Oil needs to be shipped in as well, which is probably why even the Republican Governor seems to be for the Electric Car scheme Project Better Place is considering. One state lawmaker tried to steal the money for the Light Rapid Transit line being built in Honolulu to balance the state’s budget. I wonder if some will complain part of the cost of building either rail on Oahu or expanding the H-ROutes(the Expressway system in HOnolulu), the fact that much of the stuff being moved between US Ports has to be carried on US Flagged, US Owned, US Built, and US Crewed ships? (I personally think the Jones Act is a good idea, and not just because it was passed by a Washington Senator 80+ years ago, but there is a national security element to it, and it does not stifle innovation, the innovative designs can be imported, they just have to be built in US Yards). What makes rail and highways expensive here is our geography, with all our hills. Now in the Bay Area, BART can be costly, not too many heavy rail systems in the US run on Indian Gauge(5’6″). They should have gone with standard gauge for BART. While it is extensive for suburban areas (as you can see here in this map I made), it isn’t for the rest. They seem to favour suburbs first. Simply put, O’Toole is a liar. I’ll bet his favourite burger at Burger King is the Whopper, ha ha. And I don’t want to eat there again, ever. Yes, Kemper Freeman is a member of the ADC. I’ve seen this before. P.S. At least we are going to go with making the Transitway LRT, but only partially. You can see what I did here. I’ve sent a letter to the editor of my city’s newspaper, the Ottawa Citizen, complaining about BRT and bringing up Curitiba and concluding with arguments in favour of LRT over BRT. There were some others I left out, like the fact that OC Transpo (the local transit authority) went on strike over the past winter. Given that the O-Train (which is actually light rail that isn’t electrified) was the only transit in Ottawa from Feb. 2-6 (after the strike ended, and before buses could start again as they were frozen by all the snow), it would seem that LRT is better than BRT, in the end. I hope the Transitway isn’t going to end up like your downtown tunnel with LRT, as I would prefer. It’s good to sometimes have buses, but I think that can be problematic, so LRT makes more sense to me. We’re more comparable to Calgary, Edmonton, and Salt Lake City than to Curitiba or Bogota. I should add that it is the OC Transpo workers, not the management, who went on strike. I am dependent on the slow, crush loaded bus. The strike began on December 10, 2008 following a vote by the workers, and was ended by emergency legislation approved by the Parliament of Canada on January 29, 2009. Here’s a video I recently shot of the downtown crowding. Sorry about the absence of sound. The “BRT Supporters” around here would never go for what Curitiba did to make the bus more attractive, as some are the same that oppose land-use planning. Also, they should check the latest info out of Curitiba, they are building a rail transit line, and hope to have it finished by 2014(in time for the Soccer World Cup). Please do remember that when the decision was made to build BART at 5’6″ (1676mm), it was very seriously thought that the interstate railroad system that we are still of course using today, would be all pulled up and gone before BART opened. That is patently false. California does have growth management. Here is link documenting it. http://closup.umich.edu/publications/reports/pr-2-growthmgmt.pdf. Growth management laws coupled with rapid population growth caused by high immigration levels are two main factors of the housing bubble. Other factors include low interest rates driven by down by government policy. You should read Housing Boom and Bust by Thomas Sowell. I guess liberals have their own myths. So 20 out of 128 communities in a very broad definition of Southern California (adds San Diego County, which I might, but also adds Santa Barbara County, which I wouldn’t to the SCAG six) have “Urban Growth Boundaries”…? …That is NOT Growth Management and certainly not the State Mandated Growth Management one finds in Washington State! But by all means, continue the conservative tradition! Blame them furriners and “the bankers”. note the unfortunate picture: it depicts rail in the midst of a highway without pedestrian access. that is a flaw of the Tukwila (sound move) and Shoreline (ST2) alignments. we still have time to change the latter, though it would add cost. Eddie, that segment is actually the Airport Link extension. Note the Port’s blue traffic signs. 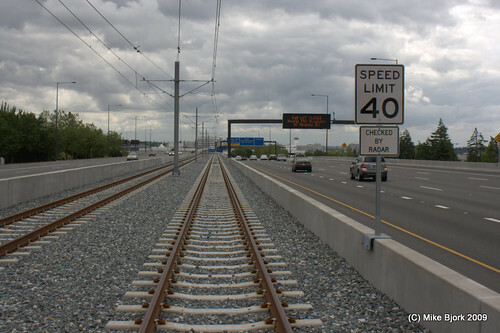 The guideway only travels along the highway median for a partial segment, then elevates to the Airport Station, the only stop northbound until Tukwila. In this case, using the highway right-of-way is a smart move since there are no intermediate stations along the alignment that would require pedestrian access. We can’t change it without a new funding source. We must make it to Snohomish County for their segment to attach. This argument reveals an almost Republican abhorrance for facts. When you get into tacoma link, you go 20 blocks. When you get into an ST Express Bus, you go 20 miles. Which one of those two things should be cheaper? By this argument, why don’t we just replace all the express buses with half mile trolleys? I hear they are cheaper per boarding. Between the ADC and this argument, I’d say the ADC’s reasoning is (astonishingly) the more well-reasoned. By the way, as far as the point of this article is concerned, buses are way cheaper than trains. Period. Say you are in Penn Station. What would be cheaper, paying Bolt bus cost plus profit to bring you to Washington DC, or paying a subsidized price to take Amtrak? I’ll give you a hint: Bolt bus costs $20, Amtrak costs $80. And Bolt bus is the one making a profit. Trains make sense for two reasons: 1) sheer capacity (and I mean a subway train with 1500 passengers each, not a dinky light rail train) or 2) when everybody refuses to ride buses but is willing to ride a train (as is the case in Washington). Those are the legitimate arguments for trains, don’t try and fight an uphill battle by trying to insist they are cheaper, it hurts my brain to hear that. If you want to make a more accurate comparison, then take a look at TriMet’s MAX buildout versus their bus system. CPB of MAX: $1.91, Bus: $2.89. There are reasons why Amtrak is more expensive than comparable inner-city bus service, which I will not go into detail, but it’s similar to why Sounder has a pretty high CPB. You pretty much hit the nail on the head yourself. We don’t compare buses with Amtrak precisely because you’re looking at long-distance, diesel locomotive trains that DON’T carry comparable passengers or capacity with rapid transit. I think you missed the point here. Cost-effectiveness of trains goes up once ridership increases. How much easier is it going to be drawing new passengers aboard a bus as opposed to a train? You might want to check the costs associated with the fuel tax on diesel, excise tax on tires, GVW fees, etc. Comparing all of MAX with all of the TriMet bus system would be better than using Tacoma Link (a free shuttle from downtown to a free parking garage) but it’s still not going to compare apples to apples. Cost per boarding tells you nothing about cost per passenger mile, usually doesn’t include cost of capital, sometimes doesn’t include fare recovery and all of the other required pieces of data to determine cost effectiveness. CPB is really only valid when comparing alternatives for a given route or a comparision of similar systems. For example you could compare cost of boarding for Tacoma Link to the CPB of the free bus service it replaced. Or compare the cost per boarding of Tacoma Link to the SLU trolley. An interesting one would be the cost per boarding of South Sounder with it’s sister route to the north (factoring in fare recovery). You’re referencing Heritage, which is infamous for reporting false numbers on transportation issues specifically? Well, anyway, legitimate research has shown that the fuel tax, excise tax, and other motor vehicles taxes don’t even come close to paying for the cost of the road network. They don’t even pay for the Interstate Highway system, they don’t pay for the state roads, and don’t get me started about the big cost center: the local roads. Way too much detailed reading. At a transit forum hosted by Dave Ross, I attempted to make a simple (at least I thought it was) comparison, and he replied (after his eyes glazed over) “By this time, you’ve lost half of my listeners!”. Since I was so immersed in the transportation process at that time, I figured I WAS simplifying the argument. Although, be careful, if you make the point TOO SIMPLY, it then becomes a target for those opposing your point of view. For instance, take the statement describing “induced demand” for freeway lanes – “Build it and they will come”. Sounds good to transit supporters, but road warriors will dismiss it, and the data behind it. Even when I was deep in the analysis for I-405, I still didn’t have the clear mental picture of how, what, why, and where (and when, come to think of it). But here is one approach that started forming a more cohesive picture. Start by going back in time, when PRIVATE COMPANIES ran the transit systems. That alone tells you that, at minimum, transit PAID FOR ITSELF (and presumably generated a profit). What put them out of business? Government funded highways. Except for a few major roadways back east, no investor came along and built a parallel roadway, and charged a fare to use it. Since the government used various tax sources (in addtion to gas taxes) to fund these roads, it would stand to reason that road building was a socialist redistribution of resources. Social Engineering! So when someone proposes that more lanes are the answer, simply ask for the ‘business plan’. How will it make money? Or at least, pay for itself. There really aren’t many numbers you have to internalize to make the argument for transit. 1 freeway lane carries 2100 vehicles per hour uncongested (defined as 45mph avg). A congested freeway lane, at maximum carries 3100 vph (35mph avg). In order to decongest a freeway lane, you only need to draw 1000 ‘riders’ from that lane. Now the Induced Demand portion of the equation comes into play. If people see uncongested freeways and decide to make a trip, (i.e. those who come when you build it), they clog up the ‘congestion reducing’ capacity of that new lane. For the I-405 analysis, it was set at about 1/3. So your new lane will really only pull over about 1500 vehicles. Works if you only have a 1-lane-in-each-direction freeway. Most freeways I’ve seen have 2. Solution? Build another lane. Then you take care of decongesting the 2 lanes, and have a little excess capacity for future growth. The other side of the coin is the cost. In the Puget Sound area, an average freeway lane is around $20 Million per lane, per mile. Freeway lanes do a better job at relieving congestion because you don’t have to convince anyone (of the 1000 vph) in the adjacent lanes to ‘change modes’, they just change lanes. Play with these numbers. It’s simple. Just pretend you’re going to be that Private Company that will solve the congestion problems without the big bad government, and think about how you would get ‘new customers’ to use it. And if you think the gas tax is the so-called “user fee”, then realize that you should only be getting the contribution based on the amount of driving done on your segment of roadway. And don’t cloud the issue with ‘trips’. You would only get money for gas burned for the miles driven on your new road. If you had a small freeway, with a beginning, an endpoint, and one on/off interchange in the middle the number of ‘trips’ doesn’t matter, since you can’t charge full bore for someone only going halfway. Remember, SR-520 is considered congested, but NOT all day. If you have your new freeway there, you won’t be able to draw people over if they are getting the existing roadway for free. When will it be paid off? MAKE the road proponents exercise theirs! That is an awesome comment. Thank you. I agree we need simple, strong arguments – and I make the business argument constantly. With the exception of the Bus Riders Unions, the people who say bus transit works better than rail are the people who never take public transit at all, but fear the taxes that building new transit infrastructure would cost them.